Today in the United States, there are 18 million children under the age of 18 who are children of immigrants or immigrants themselves—26% of the school-aged population. These numbers echo across the world. Children of migration come into school eager to learn and thrive. Yet because of existing policy and entrenched prejudice, they are often marginalized. Considering increasing polarization in the public debate about migration, the rise of hate-based incidents and violence inside and outside of schools, as well as the growth in the number of children from immigrant-origins families entering our educational institutions, ignoring the situation is not an option. At Re-imagining Migration, we seek to present a research-based, fresh, new perspective on the experience of migration for educators. The story of migration is the story of our shared human experience. Stories of migration shape and are shaped by our understanding of history, literature, art, sciences. Ignoring them breeds misunderstanding and polarization. Understanding them can reconcile us with our common humanity and inform our interactions in a world of increasing diversity and complexity. We believe educating young people to recognize our shared narratives and learn to live with, work with, and respect our differences is essential for the survival of democracy. To address these issues, we presented at Share My Lesson’s webinar, A Framework to Address Anti-Immigrant Bias and Encourage Culturally Responsive Inclusion with ADL Education. At this webinar, we introduced the Re-imagining Migration Learning Arc, our recently developed framework that aims to guide educators in their efforts to teach migration and suggested resources, our own and the ADL’s that educators can use to bring this work to life in schools. In this recent Education Week article, Veronica Boix-Mansilla and Adam Strom address three blind spots that often challenge migration education, and how educators can overcome these to prepare youth for the most pressing civic challenge of our time – navigating a world on the move. Our newly developed Learning Arc provides educators and institutions with a research-based, comprehensive and actionable set of principles and questions. Moving Stories is a tool that engages educators, students, their peers and communities to reflect on their experiences of migration through storytelling. You can download the app via the link below – make sure to take a look at the Educators Guide for information and classroom goals, suggested activities and guidelines! 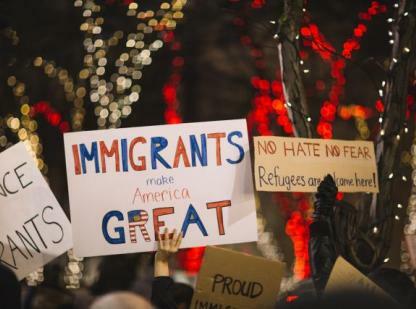 Anti-immigrant sentiment and bias are spreading through schools and communities – this curriculum has some ideas on the skills and knowledge that teachers can equip themselves with to support and understand their immigrant-origin students and their peers. Educators, you can use this checklist to as a self-assessment tool to extend your understanding of culturally responsive teaching values into in-classroom practice. The Bintel Brief was an advice column in the early 20th century that published letters from Jewish immigrants and their children as they navigated a new land, cultures and experiences. In our resource, we include a selection of the letters along with historical context and teaching ideas for the classroom. We highlight a collection of letters from Irish immigrants, their lives, journeys and experiences in new communities in the US. In this resource you will also find historical context and teaching ideas for the classroom. In 2017, fifteen young Latina women wore Quinceañera dresses to reaffirm their identities and protest an immigration law in Texas. With the help of our guiding questions, you can encourage students to think about this instance and consider what youth-led civic action entails.